Approximately 1.5 years after the World Humanitarian Summit in Istanbul, representatives of the humanitarian sector welcomed the achievements made so far, and identified the changes required by the humanitarian sector to contribute toward lifting the most vulnerable out of crises between now and 2030. 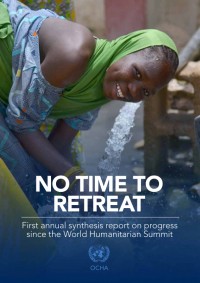 In the first annual synthesis report published since the World Humanitarian Summit and entitled ‘No Time to Retreat’, 142 stakeholders described their efforts made from June to December 2016, including with regard to the implementation of the the Core Humanitarian Standard (CHS). The Agenda for Humanity called for demand-led humanitarian action that engages affected people as central drivers of building resilience, further reinforced by the Grand Bargain workstream on the “participation revolution. “Since the Summit, the Core Humanitarian Standard on Quality and Accountability has gained ground as a common reference point for making humanitarian action more responsive to affected people, and many stakeholders reported on measures to strengthen the participation of affected people through feedback and complaints mechanisms,” the report reads. The Agenda for Humanity also demanded that an end be put to the discrimination against women and girls in humanitarian response. It committed to empowering women’s leadership; to ensure that children and young people in crises have access to education and that their skills are harnessed; and to ensure that the needs and capacities of the most vulnerable are at the forefront of humanitarian action. OCHA notes that few reports referred to women and girls with other vulnerabilities and recommended to apply the CHS self-assessment to address this shortcoming. The Agenda for Humanity called for humanitarian responses to be led, whenever possible, by national and local actors. International support should be tailored and based on complementarity. It should strengthen the response capacity of affected States and communities rather than seek to replace it. In other words, international actors should add value to what people and communities already do to help themselves. Stakeholders identified the Core Humanitarian Standard as a key driver for to support the shift in this direction. “Oxfam International and CAFOD integrated the CHS throughout their manuals, tools and guidance, and World Vision International worked with other partners to translate the CHS into local languages to make it accessible to staff and communities,” the report continues. At the World Humanitarian Summit in Istanbul in May 2016, participants made 3,700 commitments to advance the #Agenda4Humanity. Some commitments, such as localising aid and longer-term support for refugees, have made more progress than others, including protection of civilians and ending conflict. Find out more in this animation.